14:45 Hello and welcome to AUTOSPORT's live coverage of the first practice session for the United States Grand Prix at Austin. 14:49 It's been an eventful few weeks for the sport since the conclusion of the Russian Grand Prix in Sochi, with both Caterham and Marussia failing to make the trip across the Atlantic after going into administration. 14:57 BEN ANDERSON: "Lotus has decided that Romain Grosjean will be the guinea pig for its experimental non twin-tusk nose in this session." 14:58 For this session, Max Verstappen and Felipe Nasr will be in the saddle, replacing Jean-Eric Vergne - who the Dutchman wants to be his team-mate next year when he makes his race debut - and Valtteri Bottas respectively. 15:01 The green light is on and the cars start to hit the track. 15:02 Only Daniel Ricciardo and Kevin Magnussen are yet to leave the pits. 15:04 Magnussen takes to the track too. 15:04 Raikkonen's Ferrari is boasting a rather odd-looking sensor, the Finn doing a constant speed run. 15:05 All drivers have taken to the track now, and Rosberg sets the first time of the day with a 1m50.219s. 15:05 He's quickly outpaced by team-mate Hamilton with a 1m49.164s. 15:06 Raikkonen's car is wheeled back to the pits, where everyone currently is bar Hamilton and Sutil following a spate of installation runs. 15:08 Nasr appears to be having a right-side sidepod changed on his Williams in the pits. 15:08 EDD STRAW is up at Turn 1 for this session. He notes a slight lock-up from Hamilton heading into the corner. The tricky uphill approach is bind so it takes drivers a while to nail the braking point here. Rosberg, by contrast, was fine with the fronts but the rear was unstable under braking and at turn-in. 15:08 Most cars are back in the pits after the installation laps. Sauber's Adrian Sutil has gone third quickest (and slowest) of those with a time. 15:10 Sutil peels into the pits having completed four laps, the most of anyone so far. 15:11 Vettel and his Captain America helmet have taken to the track now. Everyone is being cautious on the throttle at the exit. 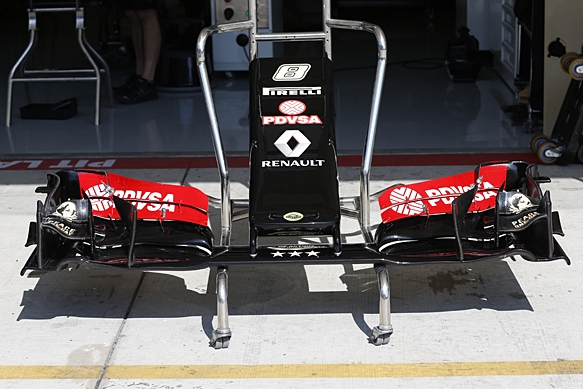 The reduction in rear downforce this year means the cars are far more grip limited at the corner exit phase. As the road drops away out of this turn, it's even easier to get the rear out of shape. 15:14 There still appear to be a number of small damp patches on the circuit after overnight rain, but their effect on the timesheets will be minimal. 15:15 The track is getting busier again in the second half of the 'extra tyres bonus' period. Half the field is out and both Mercedes improving. 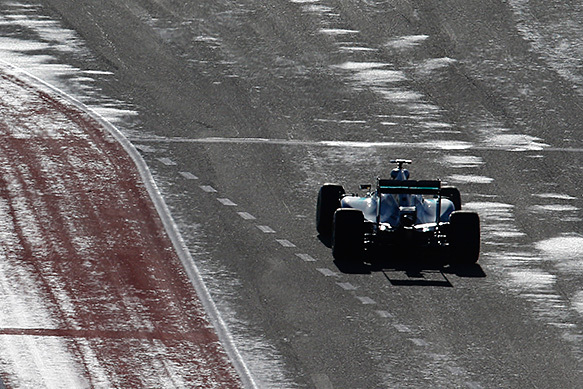 15:15 Rosberg goes fastest on a 1m46.317s, but Hamilton is quicker than that on the splits. 15:16 Hamilton goes quicker on a 1m43.517s, but that's soon beaten by Button, who sets a new benchmark of 1m43.245s. 15:17 Verstappen has also set a time, going fourth quickest before being demoted a place by Magnussen. 15:17 Button improves the benchmark to a 1m41.772s. 15:18 Williams test driver Felipe Nasr pops himself into third place, between the two Mercedes. 15:19 Verstappen improves on his previous time to slot back into fourth, behind fellow Friday guest Nasr and ahead of Rosberg. 15:19 One or two sparks coming from Verstappen's Toro Rosso as the 17-year-old rides the kerbs. 15:19 Alonso does Ferrari's first competitive time of the day and goes second, albeit 1.4s off Button. 15:20 Times are shuffling rapidly as the track comes properly up to speed. Felipe Massa is now second between Button and Alonso. 15:20 EDD STRAW has moved round to the Turn 3-4-5 section, where he notes that Nasr is "certainly spectacular". 15:21 As Button improves his session-topping time to a 1m41.158s, team-mate Kevin Magnussen makes it a McLaren one-two. 15:21 The Lotus isn't the only car sporting a new look for this session - the McLarens are sporting some rather garish orange SAP stickers on their sidepods this weekend, as this tweet from McLaren shows. 15:22 Small lock-up from Alonso there going into Turn 12. The Spaniard is currently sixth quickest, his expected departure from Ferrari still yet to be confirmed. 15:22 Daniel Ricciardo and his curious facial hair go third for Red Bull, ahead of Williams's two Felipes. 15:23 Magnussen closes up on Button at the top, the gap coming down to 0.306s. 15:23 Nasr reclaims third from Ricciardo. 15:24 Third place changes hands again: this time it's Raikkonen grabbing it for Ferrari. 15:24 "Front is a bit weak in the high-speed corners, and the rear is tricky to manage on traction. But not awful," is how Ricciardo describes his Red Bull to his team over the radio. 15:25 EDD STRAW at the trackside: Kvyat is all over the place, constantly correcting the rear and stabbing at the throttle. Messy, but he's keeping the minimum speed up and hanging on. He's certainly not lacking the confidence to attack. 15:25 Alonso interrupts the McLaren formation to go second for Ferrari, a tenth and a half down on Button. 15:26 On a lap just before that, Alonso took a chunk of the kerb on the apex of the first left-hander, EDD STRAW reports. It slightly destabiiises the car, but not too much. Raikkonen is much smoother through that section, but seems slower. 15:26 Hulkenberg is the only driver still yet to set a time, but the German is on track. Most laps so far goes to Rosberg, on 10. 15:26 Magnussen now deposes Button from the top spot, beating his team-mate by 0.08s. 15:27 Last few minutes before the extra tyres have to be returned, and 16 of the 18 drivers present are in action. 15:28 Championship rivals Hamilton and Rosberg are currently fourth and sixth, split by Raikkonen. 15:30 "Front tyre is de-laminating," Grosjean tells his team over the radio before promptly diving into the pits to get it checked. 15:30 Rosberg hinted at an improvement but aborted the lap and pitted. 15:30 Everyone is back in the pits now, with the exception of Button. 15:31 Replays show Vettel suffering a small lock-up exactly where Alonso had one a few laps back, at Turn 12. 15:34 Button enjoys the track to himself and grabs first place back from Magnussen with a 1m40.319s, seven tenths quicker. 15:36 Worth noting that the top three currently - Button, Magnussen and Alonso - are all drivers who may be off the grid next year, depending on how the driver market pans out. 15:36 EDD STRAW reckons Turns 3-4-5 at Austin is one of the best places to watch F1 in the world. It's interesting to contrast the balance and direction change of the various cars: The Williams changes direction brilliantly, the rear momentarily seeming to break traction but staying under control, whereas the Toro Rosso rear end is unstable and doesn't recover quickly. 15:38 Pacesetter Button improves his time in the first sector, but tails off around the rest of the lap. 15:38 Button has surpassed Rosberg's record for most laps set so far, having now completed 12. 15:40 The Brit's back in the pits, meaning there isn't a single car running at the moment. This section of track can be a nightmare in the race because of traffic. As we saw in 2012, when Vettel lost momentum behind Narain Karthikeyan's HRT and left himself exposed to an attack from Hamilton, there is little opportunity to lap a slow car between Turns 3 and 7. The absence of Caterham and Marussia will at least make that less of a concern for the frontrunners on Sunday. 15:41 Still no one back out on the track to get the second half of the session going yet. 15:43 Verstappen is the first man to leave the pitlane again, closely followed by Magnussen. 15:45 EDD STRAW: Verstappen was cautious on run one and said yesterday that he wasn't worried about laptimes - he knows the time he needs to be quick is the start of next season. It's a mature approach, and while he's taking it easy, he's far from slow. 15:45 Kvyat, Vettel and Hulkenberg - the Force India yet to set a time - are also back out. 15:48 Ricciardo's having trouble with his energy recovery system, and it seems the Australian may be out of the rest of this session. 15:49 Hulkenberg finally sets a time, slotting into 15th place ahead of team-mate Perez. 15:49 Vettel goes fourth quickest, though he's instantly beaten by Kvyat. 15:50 Hulkenberg improves slightly more, going 13th ahead of Maldonado. 15:50 Verstappen moves back into the top 10, going ninth fastest. 15:51 Magnussen hinted at improving his time with better first and second sectors, but the end of the lap is slower and he stays second. 15:51 Magnussen is in maximum attack mode, EDD STRAW notes from trackside, in big contrast to Button. 15:52 Also on the limit is Verstappen, who grabs an armful of oversteer coming through the first sector on that last lap. 15:53 Rosberg was fastest through the second sector, but spoiled his lap running wide at the last corner. He goes sixth for now. 15:55 Hulkenberg moves up to seventh place between the Mercedes, despite reporting difficulties with brake balance to his team over the radio. 15:55 Hamilton is on a potential session-topping lap now based on his pace in the splits. 15:56 Like Rosberg, though, Hamilton loses time further around the lap. He remains eighth. 15:57 Rosberg does gain ground next time around, going second to Button on a 1m40.675s, three tenths down. 15:57 Little to choose between the two versions of the Lotus at the moment. Maldonado is 17th in the twin-tusk variant, three hundredths clear of Grosjean's new-look machine. 15:58 Hamilton now grabs the top spot with a 1m40.106s, finally ending McLaren's time on top. 16:01 EDD STRAW: Rosberg's direction change in the esses was very sharp on that lap. He didn't seem to have any problems with the rear. 16:01 Sutil spins at Turn 19, but he's able to continue without too much ado. The German just put a wheel on to the damp astroturf. 16:02 As Hamilton goes slightly quicker still with a 1m40.044s, Rosberg makes it a Mercedes one-two, 0.189s down. 16:07 EDD STRAW: Hamilton looked stunning through the esses there. Attacking, controlled and carrying great speed. 16:07 Alonso gets a change of front wing as he pits in, although the one that was removed from his Ferrari didn't appear to be damaged. 16:08 Magnussen comes very close to doing what Sutil did at Turn 19, getting a wheel on the astroturf but skilfully keeping his McLaren pointed in the right direction. 16:08 Hamilton raises the bar again with a 1m40.004s lap. 16:09 EDD STRAW stood out at the high-speed S-bends: This section asks a lot of the suspension. While on TV it looks relatively flat, there are undulations and cambers that make it difficult. 16:10 Another improvement from Hamilton: the first place time is now a 1m39.941s. 16:13 Just four cars on track at the moment - Rosberg, Kvyat, Alonso and Vettel. Everyone else is back in the pits. 16:14 Alonso is on a better lap in the Ferrari. He's currently sixth. 16:15 Another lock-up for Alonso there, before lighting up the rears coming out of the final bend. He stays sixth, 1.1s off the pace. 16:17 Alonso has ended his run and come back in, but Verstappen is now out for some more laps. 16:17 EDD STRAW has now moved up to the hairpin, where he notes that Vettel is able to get hard on the power without any wheelspin. 16:19 Grosjean is now back on track, using the original twin-tusk configuration after his stint using the new wedge nose, as this tweet by Lotus reveals. 16:20 Ricciardo is still yet to get back on circuit, and looks unlikely to do so with 10 minutes to run. Only Grosjean currently is below the Australian in the times. 16:22 Both of today's guest runners are in the top 10 as things stand - Nasr is eighth, with Verstappen two places below the Brazilian. 16:24 "I'm struggling with the rears," says Vettel to his team over radio, while Rosberg is instructed to save more fuel by his engineer. 16:24 Raikkonen sails wide at the first corner, locking up his front-left, replays show. 16:27 A few hints of improvements in sector times from the likes of the Lotuses but no position changes right now heading into the final minutes. 16:27 Vettel is out of his car with three minutes left of this session, currently sitting seventh fastest. Red Bull has confirmed that the German will at least take part in Q1, despite the fact he'll be starting the race on Sunday from the pitlane owing to an engine change. 16:29 Grosjean enjoys a wild moment at Turn 19, enquiring to his team about the possibility of a puncture or suspension failure. Maldonado meanwhile suffers a spin in the sister Lotus, bringing out the yellow flags briefly. 16:30 Raikkonen is sat motionless in the middle of the pitlane, as his Ferrari crew members rush to his aid. Replays show him follow Grosjean's Lotus into the pits, nearly nosing past the Frenchman before grinding to a halt. 16:31 Gutierrez was on a quick-ish lap at the end but stays 16th behind countryman Perez. 16:35 Another practice session, and another Mercedes one-two. The gap between Hamilton and Rosberg, 0.292s, was somewhat larger in that session than it usually is on a Friday morning. Rosberg is 17 points behind heading into this weekend, making this a must-win weekend if he's to keep his team-mate in his sights. 16:37 McLaren meanwhile looks solid so far, setting the third and fifth best times. Splitting Button and Magnussen on the timesheets was Kvyat, who set the most laps that session with 33. Next up were Rosberg and Verstappen, both on 32. 16:38 Besides Ricciardo, whose ERS failure brought down the curtain on his session early, Nasr was the only driver to complete fewer than 20 laps, the Brazilian managing only 19. 16:42 Worth noting that the FIA trialed its virtual safety car initiative at the end of that session, a measure that's being brought in as a response to Jules Bianchi's accident at Suzuka. 16:45 We'll leave you with BEN ANDERSON's full report of that session, which can be found here. 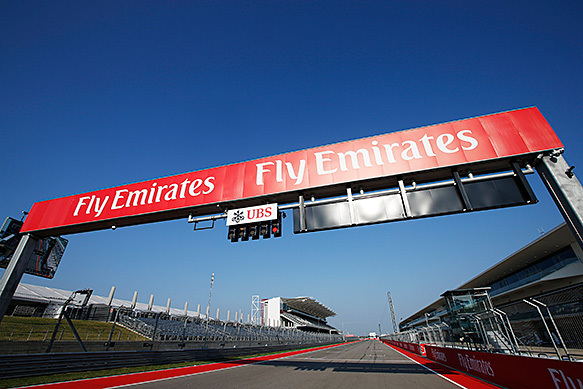 Our coverage will resume when FP2 gets under way at Austin, at around 7pm UK time time. Be sure to check out AUTOSPORT.com for all the latest news from the paddock in the meantime. 18:54 Welcome back to AUTOSPORT Live, we're minutes away from United States track action resuming with practice two at Austin. 18:55 It was a Mercedes one-two, again, in the morning, while the new battle to avoid being last of the 18 entrants was lost by Grosjean's Lotus. 19:00 The green light comes on and practice two begins. 19:02 First cars out are the Williams of Bottas (who loaned his car to Nasr in the morning), Grosjean's Lotus and Button's McLaren. 19:05 Kvyat brings his Toro Rosso out now as well. Still just four of 18 running, though. 19:05 Bottas puts the first time on the board: a 1m44.534s. 19:05 Grosjean slots in 3.2s slower than the Williams. 19:06 Both Toro Rossos now out as Vergne joins in. He was our other absentee this morning, watching Verstappen in his car instead. 19:06 Button, a long-time FP1 pacesetter, goes second, 2.4s down on Bottas. 19:06 No free practice session would feel right without an unfortunate Lotus driver hitting trouble. Grosjean gets out of shape through the twisty first sector and runs off track. 19:07 Grosjean goes briefly second, before Button leaps ahead of Bottas and the Lotus to go quickest on a 1m42.427s. 19:08 Magnussen, Raikkonen and Hulkenberg have also now exited the pits. 19:08 Raikkonen is told that the wind seems stronger than it was this morning, but in the same direction. Mercedes reveals on Twitter that track temperature has increased by 10 degrees since the end of FP1. 19:09 More on the wind, this time from Button: "Wind is playing a big part, wind playing a big part." 19:10 It's now a McLaren one-two, as was the case for much of the morning, with Magnussen second, 0.3s behind Button. 19:10 Hulkenberg goes third for Force India, behind the McLarens and ahead of the Toro Rossos. 19:11 Raikkonen has done several laps but none at full speed. He's 8.6s off the pace. 19:11 Perez is told that his target laptime is a 1m49s. That's around seven seconds slower than Button's P1 time at the moment. 19:12 Grosjean and Maldonado put Lotus fourth and fifth, with Sutil going sixth behind them for Sauber. 19:12 Magnussen's rear end steps out as he hits the brakes for Turn 1. He misses the apex by a long way, but keeps the McLaren on track. 19:12 Bottas gets back up to pace and goes third for Williams, 0.4s behind Button. 19:13 Gutierrez pops up to fourth for Sauber. 19:13 Button improves the top time to 1m41.945s, eight tenths up on Magnussen. 19:13 Raikkonen's first competitive laptime puts him sixth. 19:14 Kvyat moves ahead of Gutierrez into fourth. 19:14 Alonso splits the McLaren one-two, placing his Ferrari between his potential future employer's cars with a lap 0.6s off Button. 19:14 Massa spins at Turn 1, and quickly rejoins. 19:14 Still waiting for fully committed laps from the two Mercedes, which are out on track but circulating slowly. 19:16 Button is losing his cool on the radio as he's told that one of his messages didn't come through in full. He responds by shouting his feedback a second time regarding how the wind is affecting the car's balance, and signs off with "sort the radio out!". 19:17 Hamilton puts together a clean lap and jumps to fastest on a 1m40.993s. 19:17 Rosberg has a minor lock-up at Turn 13, sending him wide off track at the tight right-hander. 19:17 Prior to Hamilton's lap, Magnussen had briefly taken first with a lap now 0.9s off the pace, but which had been 0.032s up on Button. 19:17 Rosberg had been quicker than Hamilton early in their first flying laps before that error. 19:18 Hamilton cruises around the outside of Turn 1 after setting that fastest time. 19:18 Rosberg now puts together a tidier lap and goes second, 0.506s behind Hamilton. 19:20 Ricciardo says he's "having a lot of problems controlling the rear. I'll try a cool-down [lap], but the rear is giving me a hard time". 19:20 Here comes a quicker lap from Hamilton, who does a 1m40.615s. 19:21 Hamilton has gone eight tenths quicker than Rosberg with that lap, but the German is now quicker than his team-mate in sectors one and two. 19:21 Ricciardo and Kvyat improve to go sixth and seventh ahead of Massa. 19:22 Rosberg deposes Hamilton from first place with a 1m40.078s lap, 0.537s ahead. 19:22 Vergne thrusts his Toro Rosso up to fifth. 19:22 Mercedes, once again, has a big margin over the rest at present. Rosberg is 1.538s clear of third-placed Magnussen. 19:23 Hamilton is now on a better lap than his first effort, but it's slightly off Rosberg's mark so far. 19:24 Hamilton's middle sector was slower, and he aborts the lap and heads for the pits. 19:24 Hamilton had a big snap of oversteer at the end of the backstraight which got him very out of shape. 19:26 Vergne is wrestling with his Toro Rosso in the final sector - and the car gets away from him in the final corner, forcing him very wide. 19:27 Maldonado brings the Lotus into the top 10 in ninth. His team-mate Grosjean is currently slowest of those that have been out. 19:30 Massa finds a bit of time in the first sector but less so elsewhere and stays behind Maldonado in 10th. 19:31 Maldonado was on a better lap but lost time in the final sector and stays ninth, 0.017s behind Kvyat ahead of him. 19:31 Bottas moves up from 11th to eighth, demoting Kvyat, Maldonado and Massa. 19:33 Grosjean has a dramatic high-speed spin through the Becketts-esque first section. The car stepped out of shape when he hit a kerb, and then snapped back in the other direction to send him off the track sideways. "Are you sure things are working properly?" he asks on the radio. 19:34 Lotus_F1Team: "You have to admit if this was a drifting competition, we'd be in shot for a podium"
19:36 Vettel has made it out of the pits after a long delay at the start of the session. 19:38 Magnussen is the first to start a flying lap on the softer tyres. He's currently third, 1.5s off the pace. 19:39 Magnussen stays third, but now 0.563s off Rosberg and within 0.026s of Hamilton. 19:39 Gutierrez uses softs to go fourth for Sauber. 19:39 Vettel remains at the bottom of the order, but has at least done a time now - 4.7s off the pace. 19:40 Perez goes sixth with his soft tyres, just behind Button. 19:40 Hulkenberg puts the other Force India fourth on softs, a tenth and a half behind Magnussen ahead. 19:40 Magnussen got a frightening snap from the rear through the long right-hander of Turns 16-17-18 as he pushes on those soft tyres. 19:41 Ricciardo's softs take him up to second place, splitting the Mercedes and 0.312s down on Rosberg. 19:42 Sutil jumps to sixth in his soft-shod Sauber, just ahead of team-mate Gutierrez. 19:42 The Toro Rossos of Vergne and Kvyat quickly demote the Sauber as they now take sixth and seventh. 19:43 Rosberg commences his flying lap on softs with a new 'purple' time in sector one. 19:43 Vettel has now done five laps, but still none of them very fast. He remains at the back, 4.4s off the pace now. 19:43 Hamilton's soft lap is faster than Rosberg in sector one, as Rosberg now does a new best in sector two. 19:44 Rosberg completes his soft lap and goes 1.3s clear of Ricciardo on a 1m39.088s. 19:44 Everyone is finding about a second on the soft tyres so far. 19:44 Hamilton loses a bit of time to Rosberg in the middle of the lap. 19:44 Rosberg will feel there is more time to come after that lap, as he missed a couple of apexes and lit up the rear tyres out of one of the slower corners. 19:45 Hamilton returns to second, ending the lap 0.053s down on Rosberg overall. 19:45 Those laps from Rosberg and Hamilton mean Mercedes is over a second clear of the rest once more. 19:46 Bottas goes up to 10th, which ends Sauber's little spell in the top 10. 19:46 Massa has a lock-up at the end of the backstraight. 19:47 Despite that error, Massa moves his Williams up to seventh place, which knocks team-mate Bottas out of the top 10. 19:47 Both Mercedes are now improving again after cool-down laps. 19:47 Rosberg improves his middle sector time, but not the lap overall. Will Hamilton beat him now? 19:48 Hamiton does indeed sneak ahead of Rosberg for first place, by just 0.003s. 19:48 Maldonado has spun at the penultimate corner. He ends up parked just off the track, but quickly gets going again. Maldonado lost the rear in the middle of the corner, having run slightly wide in the previous long right-hander and picked up a bit of dirt on his tyres. 19:49 Just before Hamilton set that time, Force India had told Perez that the Mexican appeared to be the only driver able to go quicker on a second flying lap on the soft tyres. 19:49 Ferrari hasn't yet done a proper soft-tyre time, but Alonso is now set to improve from his current 14th place. 19:49 Kvyat moves the Toro Rosso up to fourth, two tenths behind Ricciardo's Red Bull ahead. 19:50 Bottas returns to the top 10 in ninth, just ahead of Williams team-mate Massa. 19:50 Alonso's lap vaults him up to third place, 1.104s off the pace. 19:50 Hamilton asks how everyone else is doing on the softs, and is told "from what we're seeing, everyone is slower on lap three". 19:52 Hamilton's had a lock-up at the end of the backstraight, as has Massa. Both still made the apex though. 19:52 Massa still improves again, bringing his Williams up to fifth. 19:53 "I lost the KERS at the end of the lap", says Grosjean. The team says it knows the problem but is not able to do anything about it at the moment, so he has to continue as he is for now. 20:00 As usual, this is the part of the session where everyone slogs around on heavier fuel testing tyre life on long runs. 20:02 Rosberg is reporting some gearbox concerns on the radio. He says it's affecting the downshift. 20:03 Mercedes tells Rosberg to "just continue, there's nothing to check". 20:04 The difference between race and qualifying runs is particularly noticeable on the approach to the Austin track's tightest corners - including Turns 1, 11 and 12. Drivers are nowhere near as aggressive on the brakes as we were seeing earlier. 20:04 Rosberg completes a lap 5s off his earlier pace, which is standard for this period. For a full in-depth analysis of the field's practice form and what it could mean for Sunday's race, watch out for EDD STRAW and GARY ANDERSON's Friday form feature on AUTOSPORT later today. 20:05 A gearbox quirk for Hamilton too, who tells Mercedes about a "strange shift, fourth to fifth, across the startline". 20:06 Rosberg tells Mercedes he accidentally pressed the clutch pedal and asks it's OK to keep running. The team gives him the all-clear. 20:06 Hamilton takes a tighter line into Turn 1, as Ricciardo locks up and gives the Mercedes a puff of smoke to drive through. 20:09 As expected, seeing as he knows he's starting from the pitlane, Vettel is totally race-focused on this session. He's 5.4s off the pace. 20:09 Mercedes tells Hamilton to come in due to "an issue with the car". 20:09 Hamilton is instructed to carry out a practice pitstop as usual when he comes in, which he does now. The team didn't specify the issue. 20:10 Split strategy from @WilliamsRacing: "Both cars out now running with Felipe on soft tyres and Valtteri on mediums"
20:13 Raikkonen shares some worries with Ferrari: "I think we have a lot of slipping on the clutch, and I can smell some oil". 20:14 Hamilton has stayed in the garage since coming in with that problem. Grosjean and Vettel are the only other men in the pits. 20:16 Vergne is the latest to have a lock-up into Turn 12 at the end of the backstraight, although unlike most it's the outside front that locks. 20:16 A crackly and slightly giggly Button gives McLaren tyre feedback: "They're not getting worse. They started off pretty bad." @MercedesAMGF1: "Back to base for @LewisHamilton - out of the car. Investigations underway but looks like his #FP2 is run"
20:21 TV shots from the Mercedes garage show a lot of work going on around Hamilton's car, which is already being dismantled. 20:21 Toro Rosso tells Kvyat he's doing "a very good job". 20:22 Magnussen clocks in his 31st lap, the most of the session so far, just ahead of Bottas and Maldonado. The troubled Vettel and Hamilton have done 13 and 18 respectively. 20:24 A brief bit of long-run info: Bottas, on 21-lap old mediums, is lapping in a similar bracket (high 1m45s-low 1m46s) to Alonso, who is on softs that are around half that age. 20:24 Ricciardo is asking Red Bull about Alonso's pace, as he sizes up his likely race rivals. 20:25 Kvyat tells Toro Rosso he's "losing general grip". A torque map change is suggested. 20:25 Force India informs Perez that his relative pace is better on this run so he can focus on "keeping degradation under control". 20:25 Raikkonen has had a lock-up into Turn 1, and he couldn't get the Ferrari anywhere near the apex as he tried to turn in while flat-spotting the inside front. 20:28 Red Bull is now giving Ricciardo information about the pace the McLarens and Bottas are putting in. 20:29 Kvyat reports a vibration on his tyres. He's told to come in, lay some rubber in front of the garage, and go out again. 20:30 The chequered flag is out, practice two is over and Hamilton is fastest on yet another Friday afternoon. 20:30 Rosberg is darting around behind Bottas in the first sector, but he'd had to wait until the backstraight to make a pass as the Williams doesn't feel the need to move out of his way. 20:31 The field will now go into another 'virtual safety car' test. 20:32 Plenty of radio traffic from teams to drivers reminding them that the virtual safety car test is about to happen. Remember, Vettel didn't bother with any qualifying performance work as he plans to start from the pitlane on Sunday. And no, we haven't got used to only having 18 cars in the standings, either. 20:47 Hamilton is telling reporters in the paddock that it was a fluid leak that brought his Mercedes into the pits early in practice two. 21:14 That's it from us on AUTOSPORT Live for today - our commentary will be back in action for FP3 and qualifying tomorrow. For now, as our team of journalists work their way around the paddock speaking to the teams and drivers, keep an eye on autosport.com for all the reaction to today's running and the latest on the state of F1 as more teams fight for survival.